Innovative and engaging, this textbook is written for the student who is just starting a paralegal degree program. It provides simple and concise explanations of legal concepts and topics, encouraging students to develop critical thinking skills by applying the legal principles to numerous problems and exercises contained in each chapter. 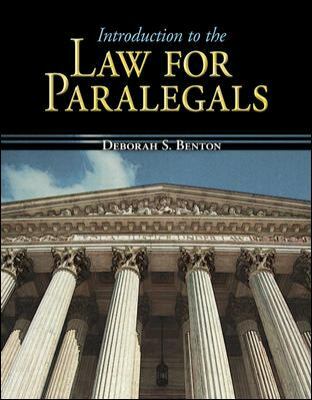 This book introduces students to the major substantive areas of law that will be covered in depth in subsequent courses.Deborah Benton is the author of 'Introduction to the Law for Paralegals (Mcgraw-Hill Business Careers Paralegal Titles)', published 2006 under ISBN 9780073511795 and ISBN 007351179X. Loading marketplace prices 10 copies from $30.82 How does the rental process work?